DK is the classic knitters’ gauge, with that perfect balance of easy knitting, warmth and wearability that works for pretty much every kind of garment. 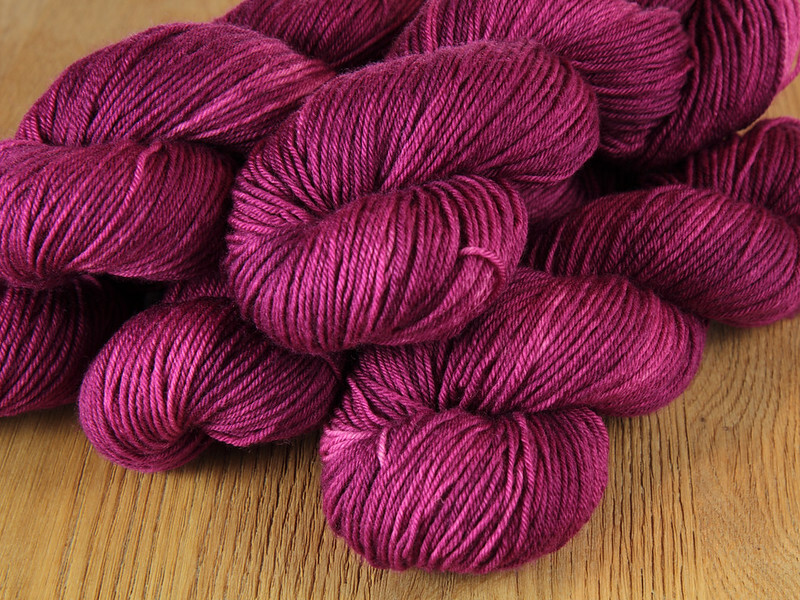 It’s been a gap in our range that has been longing to be filled, and after much work, we think we’ve got with a fantastic yarn that is, well, the bomb! 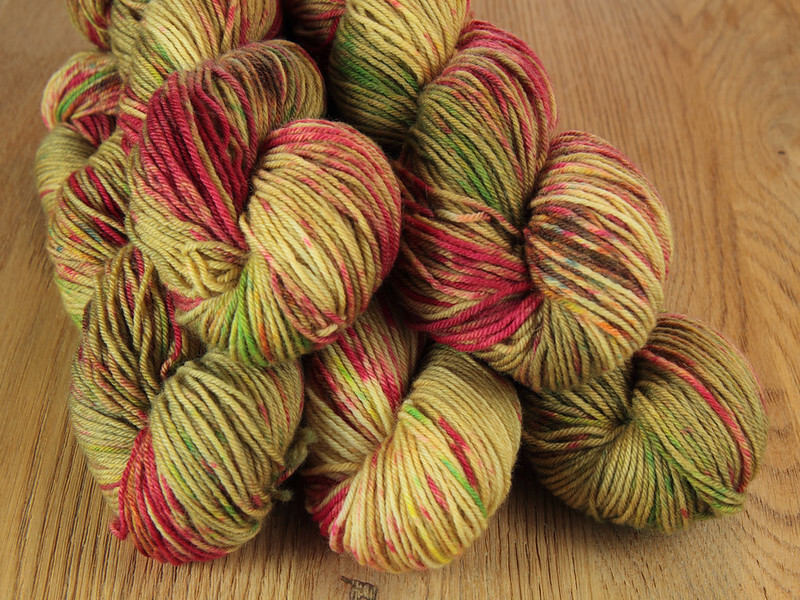 Dynamite DK is a plump, round yarn with a smooth, plied texture in 100% British fine Bluefaced Leicester wool. We have developed it very much with sweaters in mind, and developed shades accordingly – but think brights and textureful speckles rather than run-of-the-mill neutrals. Mottled tones unfold before your eyes and larger projects are a pleasure to knit from start to finish. 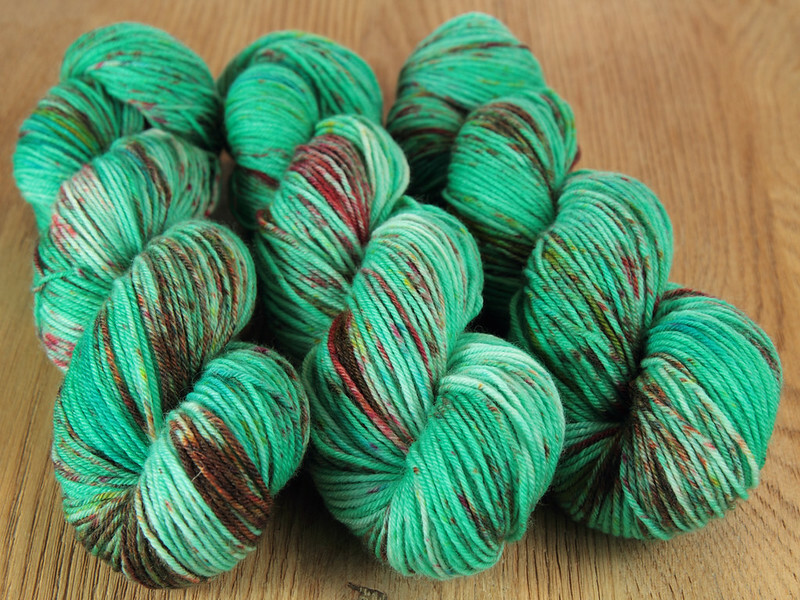 Adjectives that describe this yarn: springy, soft, firm and earthy. Bluefaced Leicester is a native British sheep breed whose fleece has a subtle lustre, unique to the breed. 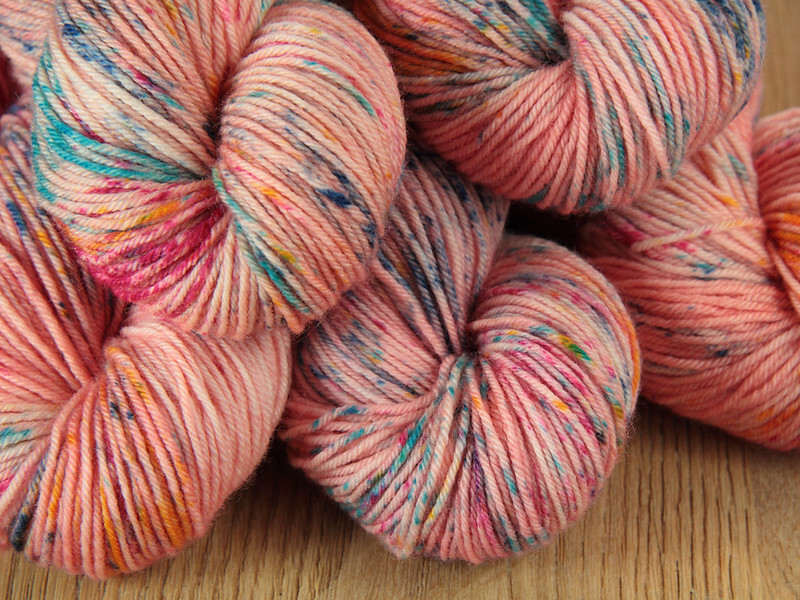 This adds an exceptional depth of colour to our hand-dyed shades (just look at that pink!). It has a long staple length (the length of the fibre) and it’s spun medium-high twist, both of which make it wear well. It has a crisp handle but blooms with a gentle halo with wash and wear. This is a superwash yarn so it’s easy to care (machine washable on a wool setting up to 40°C). Without further ado, let me show you the shades. 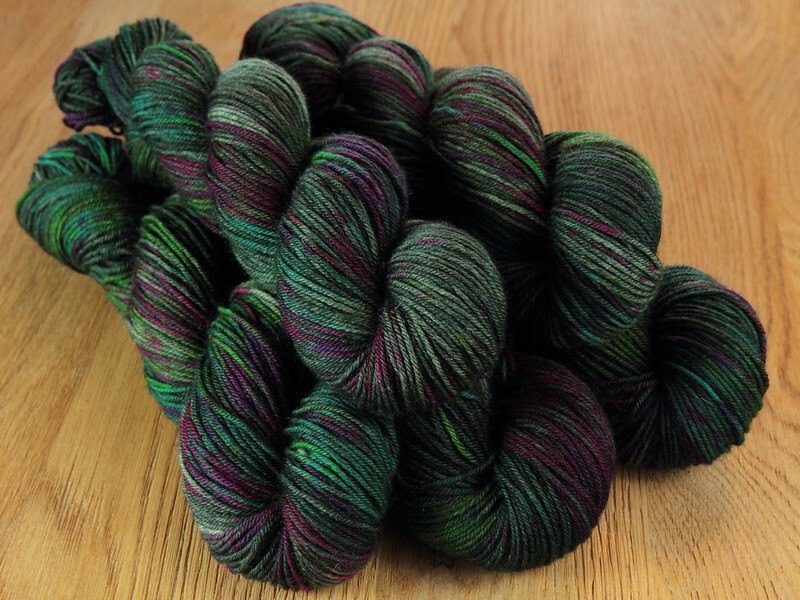 ‘Space Race’ – mottled purples, greens, blues and dark greys, another shade from our sock yarn range that works for every kind of project. These five are available for preorder for shipping before or during the first week of September. 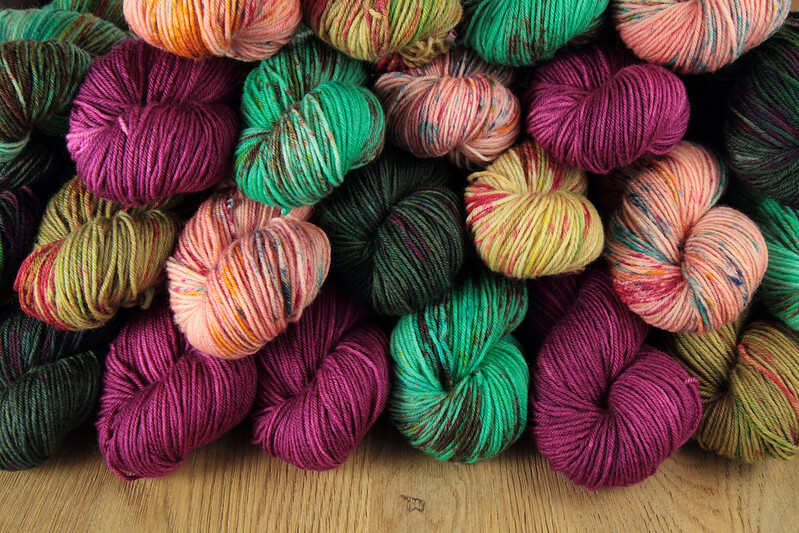 Our yarn prices are increasing from 1 September (read about why) so we’re offering preorders to match our current pricing or £14/skein rather than the launch price of £15.50, so this is a good opportunity to stash-up for autumn projects. I can’t to hear what you think of the yarn and shades!